When it comes to making coffee drinks, I tend to recommend using good quality cocoa powder or the best chocolate that you can find. This ensures that you get the most flavorful result in your drink. It also tends to excludes certain types of chocolates – such as chocolate chips. In the past, chocolate chips were frequently made with non-chocolate ingredients, including vegetable shortening and additional emulsifiers that helped the chips stay smooth and hold their shape while in the oven. These days, more companies are using real chocolate – which is typically comprised of ingredients like cocoa powder, cocoa butter, sugar, milk and vanilla – to make their chocolate chips and leaving the rest of the stuff out. May 15th is National Chocolate Chip Day and I couldn’t think of a better way to recognize chocolate chips than by putting them in a coffee drink – and serving it with a few homemade chocolate chip cookies! This Chocolate Chip Mocha is made with chocolate chips. I used Nestle Tollhouse Dark Chocolate Chips with good results. Simply pour very hot coffee over a generous amount of chocolate chips and stir until the chips are melted. 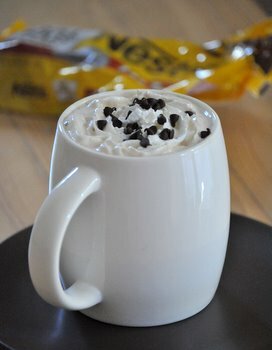 Top of the cup with warmed or steamed milk, then finish with a dollop of whipped cream and garnish with additional chocolate chips. I used mini chocolate chips for my garnish because they hold up on top of the whipped cream better than full-sized chips – although you can always stir in any chips that fall through the whipped cream and into your drink! Place chocolate chips in a large mug. Add hot coffee to mug and stir until chocolate chips are melted. Pour in hot milk, then top with whipped cream and garnish with additional chocolate chips. Note: The exact amount of chocolate chips you add will determine how chocolaty your drink is. And if you are using dark or semisweet chips, you may find that a tablespoon of sugar is also needed to sweeten the drink to your tastes.